Best price elsewhere is £170 at Currys, Argos etc. 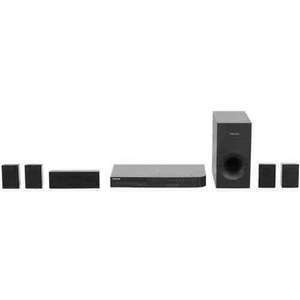 A sound 5.1 entry level home cinema system. Has apps for YouTube and similar. Bluetooth connection to iPhone etc. Heat but suggest you add the brand to the title. nice deal but I'm going to have to go for a different brand perhaps. I bought 2 samsung soundbars with wireless subs and both of them have turned out to be faulty. I now have to send the second one back now. The sub keeps disconnecting on the k450. Tried pairing it again but its not connecting back to the soundbar at all now. Maybe its just my luck dunno but I searched online and seen others have the same problem but no fix other than the one I've already tried. EXPIRED : The item is now OOS. Price also rose to £159 and Argos now stock at the same price. Deal posting newbie! This is kodiakgold first deal post. Help out by leaving a posting tip or just to show your appreciation for their contribution.